Australian Mom Welcomes 13.5lb Baby! Home » Australian Mom Welcomes 13.5lb Baby! Chelsea Rose Mackay surprised everyone when she arrived weighing almost 14lbs. The newborn is believed to be the biggest baby ever born at Townsville Hospital and one of the largest in the country. Weighing in at a hefty 13 pounds eight ounces and 55cm in length, there is certainly plenty of Chelsea for her first time mum, Danielle Mackay, to cuddle, the Townsville Bulletin reports. Born on Thursday, Chelsea measures up at twice the size of an average baby and almost five-and-a-half times the size of her little friend, Melinda Burns. Melinda was born prematurely at 818g, or just under two pounds, but is now a month old and weighs just 1.2kg. Ms Mackay said she and partner Paul Mifsud ate a diet of stockman’s tucker and also snacked on icy poles while pregnant with Chelsea but never imagined her bundle of joy would be this big. 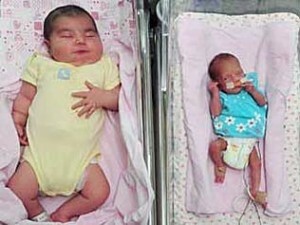 Neonatal specialist Dr Yoga Kandasamy said while most babies of Chelsea’s size were sick or had mothers with gestational diabetes, both mum and babe were a picture of good health. “She would have to be one of the biggest newborns I have ever seen,” Dr Kandasamy said. That poor, poor mama. Ouch indeed!